That's a big girl, congrats. Yup, not the correct way to handle a fish. I've miss handled fish many times. I know better but sometimes everyone gets in a hurry or the excitement overcomes your brain. 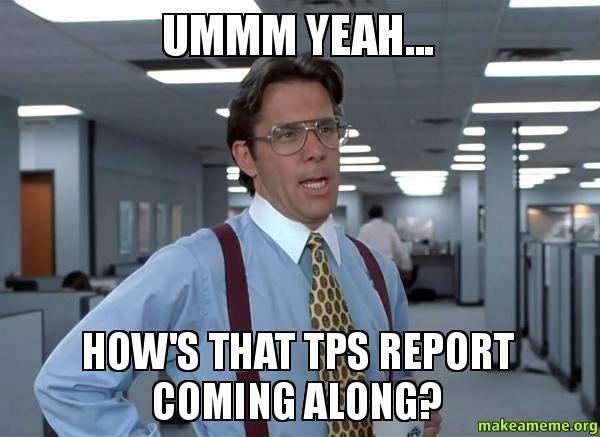 Didn't you get that memo about the TPS reports? Yeah, I'm sure we've all done it...and I didn't want to be "that guy", but not everyone knows to support the body when out of water. The pics don't show it but the water was rough with waves rolling in from the bar. I told my wife to be ready because I didn't want the big girl out of the water for very long. She decided to go in on a wave and almost beach herself and I lunged to grab her. I got her lip, water was going out and I didn't want her to touch the beach. With one swoop, yes, I picked her up, tucking the rod in, and got my hand under her all the while my wife took pics as fast as she could. The one here is not one second after the grab. 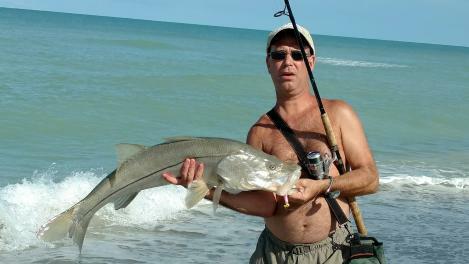 Hook out and back in the water, less than 3 seconds, revived and she swam off. The pic I posted was because my body showed a better perspective of her size. Notice the water receding as my feet are out of the water as I picked her up and the breaking wave in the background. Then the second pic shows me in the water from that wave and I already have her belly. Not how I wanted to land her but she made the lunge to shore and I didn't want her beached. No worries, most of us do our best under the circumstances. I am personally more concerned about the commercial fishermen **** the ocean and sea. It is amazing how our country kills two million babies a year and some sell their body parts, but our country is more concerned about the life of a gorilla, alligator, and the turtle/bird eggs. A private message is the way to go on this one. 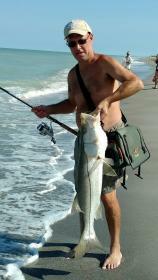 That's a great snook! What did you catch her on? On fathers day I took my family out and my 3 year old wanted to build san castles all day long.... sigh.... thanks for keeping my dreams alive. The water was very rough and dirty ( milky from sand/silt from the sw wind for days) and you couldn't see a lure 6" down so I went with an electric chicken paddle tail jig. I saw no one else catch, even bait guys. I got three all on the same jig. They all hit on the very last of the incoming and I think the water cleared just enough to let them see it until the outgoing flushed it all back out. There has been a huge school in that pass for weeks. I got a 43" two weeks ago on the fly. No worries, most of us do our best under the circumstances. I am personally more concerned about the commercial fishermen **** the ocean and sea. It is amazing how our country kills two million babies a year and some sell their body parts, but our country is more concerned about the life of a gorilla, alligator, and the turtle/bird eggs.